Working out what size crate for Golden Retriever owners should buy can be more challenging than it first appears! For starters, the best dog crate size for Golden Retriever puppies is going to look quite different than the crate size you will need when your little Golden pup grows up! How will you ever choose just one? In this article, learn about the Golden Retriever crate size recommendation from canine training experts. And find out what size dog crate for Golden Retriever puppies and adult dogs will be the best fit for your pup’s height, weight, and size! 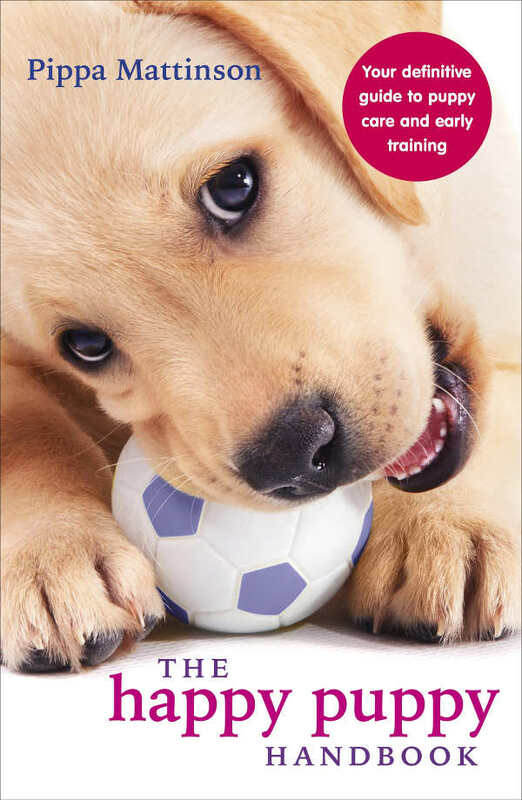 Why Crate Train Your Golden Retriever? Crate training a Golden Retriever is ideally begun during puppyhood. But if you have adopted an adult Golden, the benefits of crate training are still there! As you are likely aware, today’s modern dogs are descended from ancient wild wolves. In the wild, wolves gravitate to small, enclosed spaces for rest, sleep, hiding from predators, and raising their young. In other words, the den is a place of safety and rest. The crate is meant to replicate this same private, safe space for your Golden Retriever: a place where she can go to rest, nap, retreat, and be at peace. Crate training is also an excellent way to housebreak your Golden, since a dog’s natural instincts are to keep the bathroom in a separate area from where he sleeps. This is also why it is important to keep crate quarters close and cozy, so your puppy can’t run to the other end, potty, and then run back to have a clean sleeping corner! 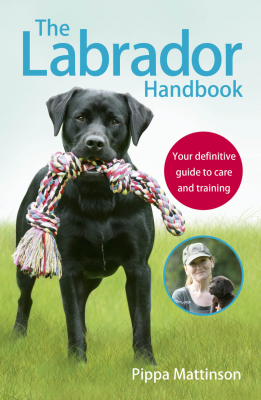 Once your puppy is crate-trained and housebroken, the crate should be used on a voluntary basis. It is there for your dog if he wants to go in, but it shouldn’t be used for punishment or forced confinement. Your Golden Retriever will start out life as a tiny puppy, but that sure won’t last long! At 7 weeks, your pup may weigh a whopping 3 pounds. Fast forward to 12 months, and that same dog now weighs anywhere from 55 to 75+ pounds! 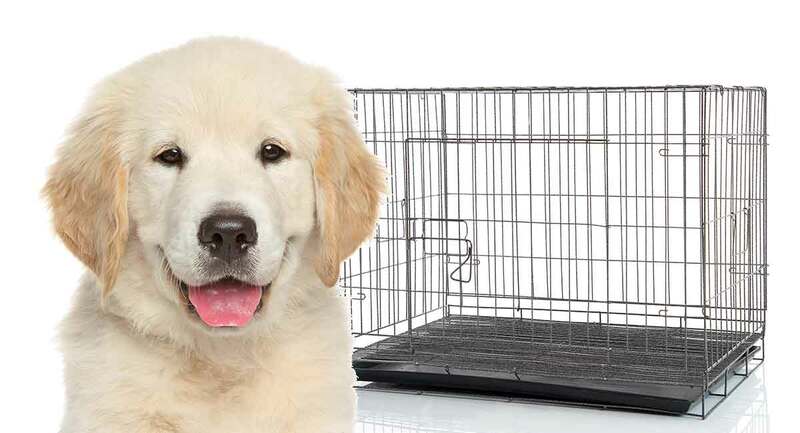 There is no doubt that investing in a training crate can put a healthy dent in your dog supplies budget, but we have a handy workaround to help you save money on your Golden Retriever dog crate! Many training crates feature a divider system. With the help of the crate divider, you can reduce the size of the crate to suit your puppy’s needs, and then remove the divider when your Golden reaches her full adult size. This way, you only have to buy one crate for your dog! The pressing question, of course, is what size crate for Golden Retriever is best? The first thing to know about correctly sizing your Golden’s dog crate is that more space isn’t necessarily better for a dog crate. You are aiming for a snug, comforting fit that mimics what a wolf might build for himself in the wild. So ideally, your Golden Retriever should be able to stand up and turn around fully inside the crate with a few inches of head and side room. Biologists researching wolf habitats state that wild wolf dens typically measure 40″L x 50″W x 20″H. The entranceway itself is about 18 inches across. These dimensions are mirrored in the recommended crate size for an adult Golden Retriever dog. For most dog crate manufacturers, the Golden Retriever will fit a large size crate. Each of these awesome crates features that key essential you need during puppyhood: the divider. Each also offers a slide-out under-tray for easy cleaning, and all will fold down for storage or travel. As well, each crate offers its own set of unique options that may work best for your budget and needs, including features like a carry handle, single or double door, or casters. This affordable, versatile, and functional metal dog crate features a side door and a front door, along with a removable divider for use during puppyhood. The crate measures 42″L x 27″W x 30″H, folds down easily for travel or storage, and has a top carry handle. The slide-out under-tray is easy to clean and replace. This sturdy and popular large adult dog crate measures 42″L x 28″W x 30″H. You can choose between a single-door or double-door crate style. Each door features a double latch system for safety. There is an optional size-reducing divider you can remove after puppyhood. This crate also comes with a slide-out removable pan for easy cleaning. The crate folds down flat for storage or travel. It also has a handy top handle for carrying. This high-quality large dog crate comes in a single-door and a double-door model and measures 42″L x 28″W x 30″H. It comes with a removable divider for use during puppyhood and a slide-out dog tray for easy cleaning. There is a top handle for carrying, and the crate folds down flat for travel or storage. The doors have two bolts per door for safety. One neat feature about this crate is the rolling feet to help protect your flooring. The manufacturer also offers a 1-year warranty. The corners of this crate are rounded smooth for safety. This popular and highly rated metal dog crate comes in single- and double-door models. Each features a double latch system with two latches per door. The slide-out, leak-proof under-tray makes cleaning easy and fast. This crate measures 42″L x 30″W x 28″H and folds down flat for storage or travel. The manufacturer offers a 1-year crate warranty. This feature-rich, high-quality two-door dog crate measures 42″L x 30″W x 28″H and comes with a removable divider and slide-out tray for easy cleaning. The crate has rounded, smooth corners for safety, and the whole crate is coated with a rust-resistant finish. The crate collapses to a width of two inches, making it easy to store or use for travel. If you don’t need a divider feature for your Golden, these crates provide a range of features, from economy to deluxe, to give you lots of options! This heavy duty, high-end dog crate comes in silver or black models and will also take spray paint, if you desire. It is rust resistant and comes on heavy-duty locking casters to rotate it 360 degrees or move it outside or from room to room as you desire. The door is actually a door-within-a-door to give you more interaction flexibility. The plastic under-tray is easy to slide out, clean, and replace. The locks have an extra feature: safety buckles to prevent escape. Owners say this robust and sturdy cage deters even hardened canine escapees! This sturdy, functional, and effective single-door metal dog crate measures 42″L x 30″W x 28″H with a double-lock door and a removable, washable tray underneath. It also folds down flat for travel or storage. This heavy duty, luxury-quality dog crate measures 40¾”L x 28⅛”W x 31¾”H, making it slightly smaller than many of the options listed here. That works for Golden Retrievers who weigh in at the lighter end of the adult weight spectrum. This cage is 20-gauge steel reinforced with ½-inch steel tubes for an escape-proof crate solution. The heavy-duty casters can be detached if desired. The grate floor has an under-tray that you can slide out to clean and replace. This functional, affordable metal crate option measures 42″L x 30″W x 28″H and features a front and side door, each with double latches. The tray slides out and back in for easy cleaning. The cage is coated with a durable anti-rust black epoxy. It folds down easily for storage or travel. The cage also offers a handy top carry handle. This fun and functional steel dog crate comes in teal blue or basic black. It measures 42″L x 30″W x 28″H and features both front and side-entry doors with double latches. The crate folds down for storage or travel and has a handy carry handle. The under-tray slides out for easy cleaning. So what size crate for Golden Retriever will work best for travel? Actually, the size recommendations don’t change when you are traveling. You want the same close, cozy fit, where your Golden has just enough room to stand up to full height and turn around fully. This is for safety as well as comfort. But you may want a different crate for car travel, specifically one that is soft-sided or plastic and lighter weight. For air travel, you will need a crate that is approved for use on the carrier you are flying with. This soft-sided travel crate measures 42″L x 37″W x 30″H and comes with its own sheepskin mat insert and carrying case. The sides roll up with Velcro hinges to offer ventilation. This 3-door, soft-sided travel crate features a strong steel crate frame covered in durable, washable fabric. The sides can be rolled up and secured with Velcro for ventilation. The frame is spring-loaded and collapsible for storage or travel, and it comes with a handy, adjustable handle. A sheepskin bed is included. This neat and unique traveling tent crate is built over a sturdy steel collapsible frame. It measures 42″L x 26″W x 32″H and features a carrying handle, zippered doors and windows, water resistant cover material, and a sheepskin bed. This is another unique travel crate option. The sides are heavy-duty plastic, and the frame is solid steel. There is a top and a side door. It measures 42″L x 28″W x 28″H. The outside is all rounded edges for safety and easy transport. The structure includes wheels and a carry/pull handle. The kit includes a fleece sleeping pad and a carrying bag. The base is insulated against the cold. This affordable, functional travel crate features soft sides with a collapsible steel frame. It measures 42″L x 30.7″W x 30.7″H and features a top and side door and ventilated mesh windows. The fabric is durable polyester. 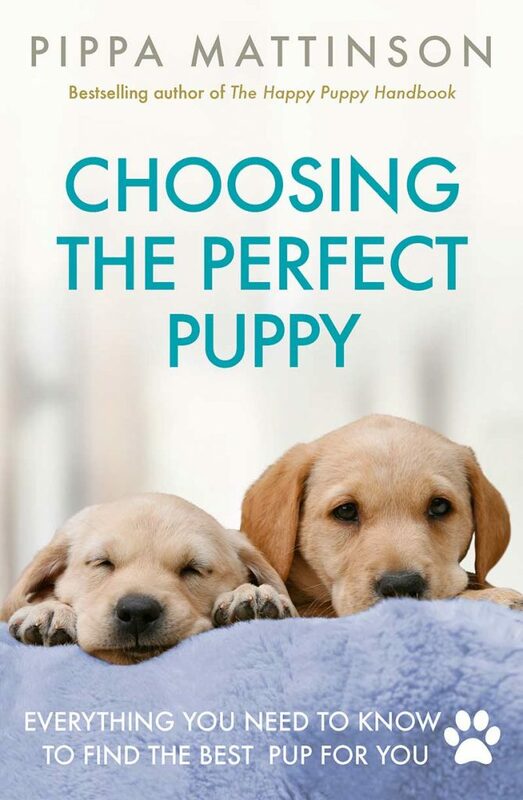 We hope reading through the recommendations in this article has made it easier for you to pick what size crate for Golden Retriever is best for your puppy or adult Golden! Let us know in the comments below which crate you chose for your Golden Retriever. Felder, D., et al, “Choosing the Right Size Crate,” The Association of Professional Dog Trainers, 2017. 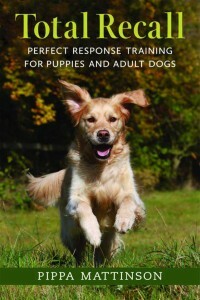 Baines, K., “Crate Training Your Dog,” Homeward Bound Golden Retriever Rescue, 2011. Morgan, C., et al, “Wolf Reproduction Biology and Behavior,” Western Wildlife Outreach, 2018. Karp, G., “How to Take Your Dog on a Plane,” Nerd Wallet, 2018. Coren, S., PhD, DSc, FRSC, “The Politics of Pet Dogs and Kennel Crates,” Psychology Today, 2012.